If you’re looking for a baby jumper, you’ll want to choose one that fits your needs and that happens to be tailored to ease up your life a bit with the baby. With that being said, there’s a ton of options to choose from when it comes to shopping for the perfect baby jumper. There are three main types of baby jumpers on the market: stationary, activity and doorway jumpers. These three jumpers are design to keep the baby active and free up your arms to do other necessary things that need to be done while the baby is in view. Stationary jumpers are stationed in one spot. Your baby will spend most of the time bouncing in this type of baby jumper. Activity jumpers are somewhat similar to a stationary jumper but it has an array of toys for the baby to play with as well, so the baby could choose to either jump or simply play. Lastly, doorway jumpers are designed to hang in the doorway with a clamp at one end of the bungee allowing for a secure grip to the doorway. They are perfect for families who don’t have a lot of available floor space. They are also portable and handy for families who love being away from home (we have even seen these adhered to trees during picnics). Below are the different features to look for when considering buying a baby jumper for your precious little one. Without a doubt, all baby jumpers come with a seat for baby to sit in. Look for a baby jumper that has seats with adjustable height mechanisms, removable seats (so you can wash them) and seats that are lined with padding for extra comfort. Despite the model of jumper you choose to buy, it is best to make sure that the jumper has multiple straps to suspend the seat. Having 2 or more straps will make sure that the baby is secure in the baby jumper as they bounce up and down. Avoiding jumpers with a single strap will reduce the risk of injury to the baby from their instability. Single strap jumpers will likely swing the baby from left to right and make it uncomfortable for the baby especially on their little legs and feet. Depending on the model of baby jumper, the weight allowance may vary on different models. However, when you’re picking a baby jumper for your baby it should be suitable to sustain the weight of your baby. 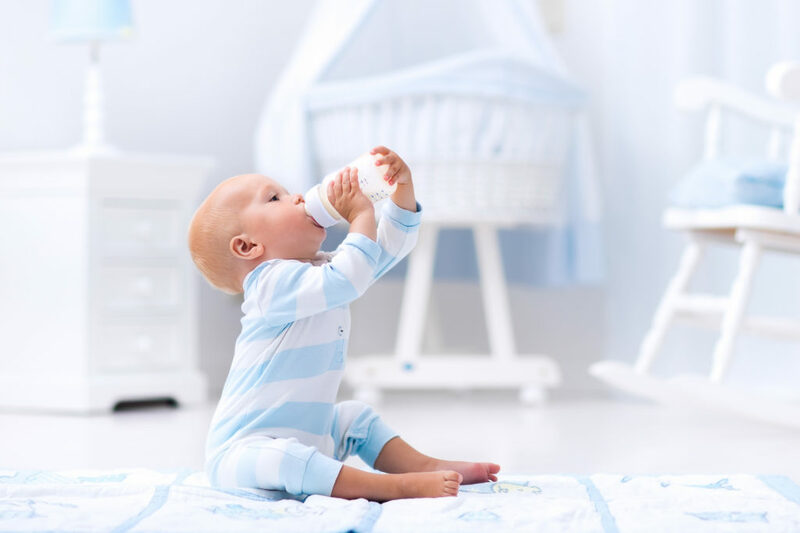 It is best to make sure to weigh your baby and check the weight requirements for the baby jumper as this will help you pick a jumper that will be more durable. Having toys that will engage the baby while they bounce up and down are great to keep their interest. 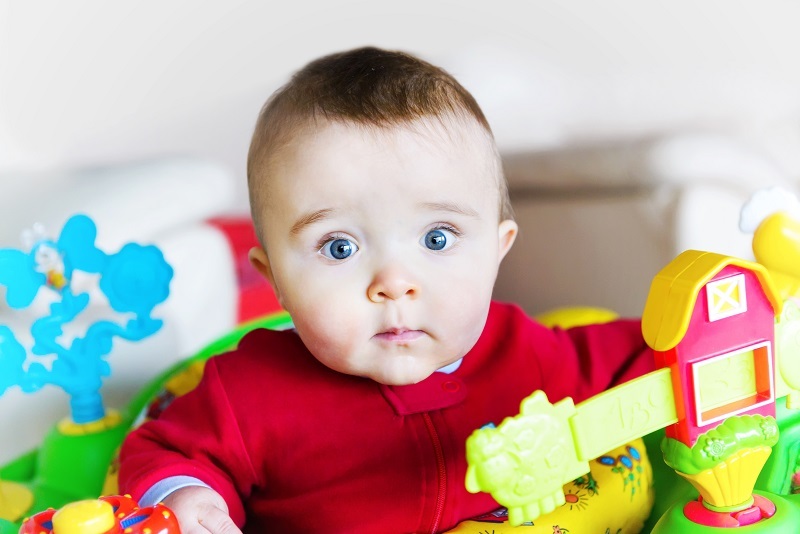 Toys with different animated sounds and flashing lights are the perfect solutions for a baby jumper and will ensure that the baby is well entertained as they spend time in the jumper. You can read more about the entertainment benefits of baby jumpers by clicking here. Buying a jumper with adjustable heights will allow you to adjust it to the right height as your baby grows. So ensure that the jumper has at least 3 or more height adjustment settings. Another important feature to look out for is to find out how easy the jumper is to store away, or how portable they are to take with you on your holidays. Researching the different models that are on the market will help you to purchase a jumper that is well-suitable for your baby, your home and your own needs. Hopefully the guidelines above will help you to choose a safe jumper that your baby will thoroughly enjoy. Click here to find some more awesome baby-related articles. Alice is from Chicago, Illinois in the U.S. She is a proud mommy of three beautiful children, including a little 6-month-old munchkin! She knows how hard it can be to find the right gear and toys for a baby (and how expensive it can be!). So she want to help you by giving you the newest and latest info on her favorite toy: the baby jumper! Read more about her passion for this baby toy on her website ‘The Best Baby Jumper’. Do you want to provide your baby with the ideal environment to develop and thrive? If so, here’s how to choose the best baby play gym available. Motor and cognitive skill development begin the moment your baby leaves the womb. As they enter the world, their senses are constantly being stimulated. Babies soon learn how to move their head around, lock eyes with mom and dad, laugh, smile, and play. They start to develop teeth, crawl, and grab things too. 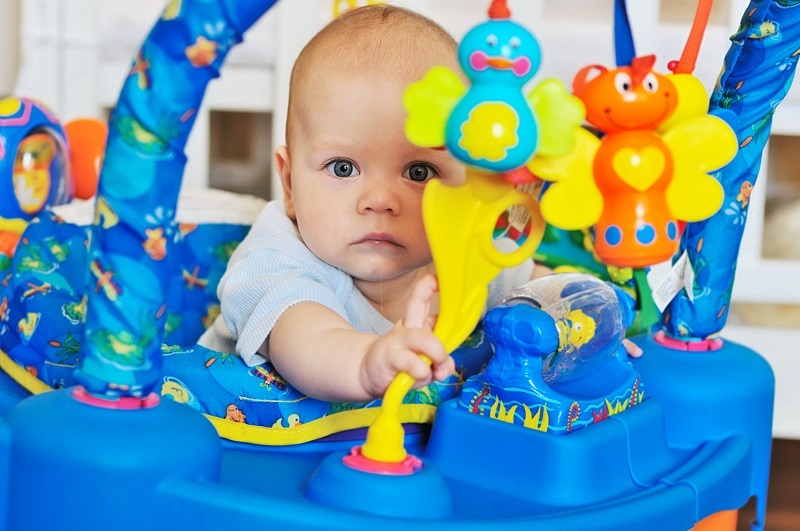 During these stages of growth, it’s crucial to have a baby play gym for your child. The right play gym can further promote sensory development, as a supplement to their daily interactions with the world around them. But, not all baby play gyms are made alike. Here’s how to find the right one for your child. Are the Toys Easy to Detach and Clean? You child’s baby play gym is something they’re going to be using every day. 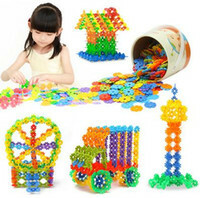 They will crawl all over it, put toys in their mouth, and maybe have an uh-oh or two while playing, as well. As such, you need to make sure the toys and mat are easy to clean! Think about the material everything in the gym set is made with. What can you wash with ease, and what will you have to soak and scrub to make sure it’s clean? 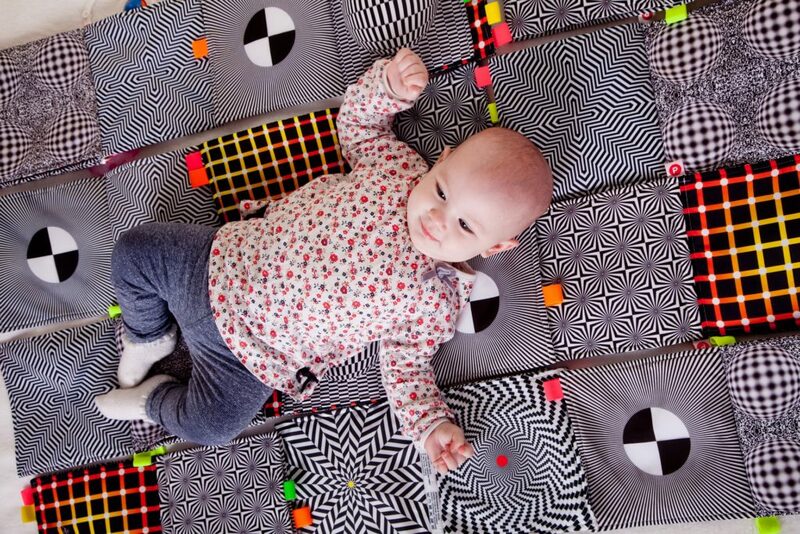 Also, always opt for a baby play mat rather than a chair or a cushion. Not only is the mat easier to clean, but it can be more supportive for your baby. When he or she is on the ground, rather than on a cushion or in a chair, they’re better able to feel shifts in their body and learn how to move the head, arms, and legs around. Can You Take the Baby Play Gym Anywhere You Go? Another thing to consider is where you plan to put the baby’s play area. Even if you and your little one tend to spend most of your days in the living room or their baby room, it’s still best to have a baby play gym you can easily move around. This gives you plenty of options for where to play in the home. More so, a play gym that is easy to pack and carry can go with you to grandma’s house, to drop off at daycare, and on any short weekend trips, you’re planning to take. The baby play gym then offers comfort and consistency, wherever your little one goes. What Skills Are Being Stimulated? As you’re deciding between the play gym with more toys or the one that’s easier to carry, consider this: which one best promotes healthy physical and mental growth? That is always the best option to go with. At the end of the day, this is the main purpose of all baby play gyms! You want to choose something that will help your baby with everything from head motions to crawling, from color differentiation to recognizing sounds and movements. The more a play gym does this – safely and effectively – the better. The play gym you choose for your child helps them take an important step in their development. But, this is just the beginning! There is so much more for them to learn as they go through school, make friends, play sports and venture into the arts, and grow up. One thing will always be constant, though – your role in their life. Throughout all the lessons a child learns, they will always be looking to you for guidance. That’s a big comfort, but also a big responsibility. For simple, easy-to-remember ways to be a good role model, click here. All moms know that a baby’s sleep schedule rarely matches up with your own. 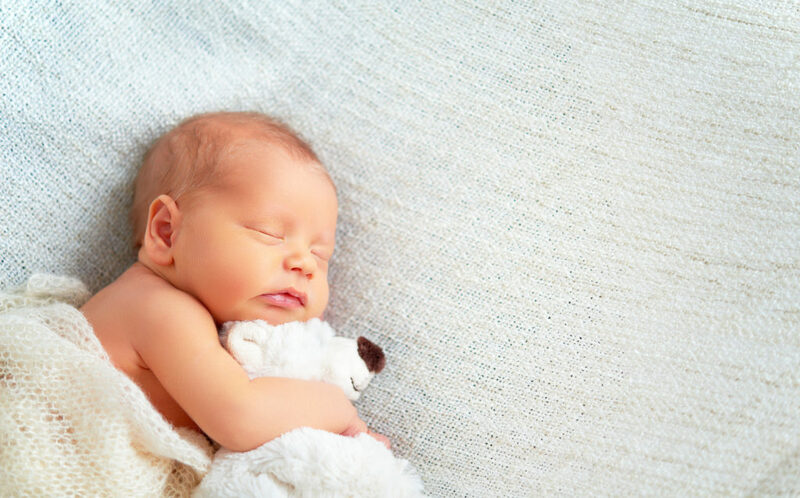 Here are some tips to help you survive and adjust to a new baby’s sleeping pattern. A bundle of joy doesn’t seem so joyous when it’s keeping you awake at 3 am. The average new mom gets less than 4 hours sleep per night. But despite how universal the experience is, moms often feel isolated and unable to cope with their situation. That’s why we’ve put together a few tips below that will help you cope with baby’s sleep schedule. It may sound easier said than done, but managing your mood will carry you through these difficult months. We think of our moods as arising directly from triggering events. But the truth is, our mood is at the mercy of a dozen factors ranging from tiredness to hunger. That’s why it’s important to see your mood from the outside if you want to manage it. Acknowledge that you’re irritable today because of a poor night’s sleep, for instance. Step away from the feeling and look at the logic–that way, you’re more likely to control your emotions. Keeping yourself healthy will also help your mood stay in check. Eat right, get exercise, and go outside. The less negative mood impactors you have, the more energy you’ll have to cope. Some babies will experience 4 or 8 month sleep regression. Figuring out your coping strategies now can prepare you for the comeback later. Motherhood is often a wake-up call in more ways than one. Accepting your life has changed rather than fighting it is a valuable state of mind to adopt. Adjusting your sleeping pattern can help ensure you’re not as burned out by baby’s sleeping schedule. That likely means going to bed earlier so you can maximize the amount of time you have to build that precious sleep into your day. If your baby has a preferred time of day to sleep, try leaning into that. Adapt yourself to sleep during those times, too. Get used to living in short bursts of time, but don’t try to cram activities. Each time you get a break, sort out the things you need to do–one at a time. Isolation is one of the biggest struggles new mothers face. But many moms feel they’re being bad parents if they don’t figure out how to do things by themselves. Don’t be afraid to reach out and ask for help. You don’t have to do everything alone. Speak to your partner or your family. Even if you’re not asking for favors, talking about your feelings can still offer a huge outlet. You’ll often end up surprised at the support people are willing to offer you. Motherhood is one of the most difficult things you’ll ever face. Overcoming your pride and accepting help is a large part of that. These are just a few tips that should help you survive baby’s sleep schedule. But no matter how bad things get, don’t forget that this isn’t forever. Your baby will soon develop proper sleeping habits, and you’ll learn to appreciate sleep all over again. Are you a new mother looking for more advice? Be sure to follow our blog.